Aboriginal people have fought for Canada since well before the War of 1812. It’s estimated that more than seven-thousand First Nations people served in World Wars I & II, and in the Korean War — not including Inuit, Metis, non-status Indians or people from the north. 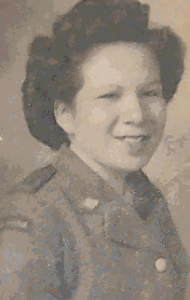 In WWII alone, nearly 4,000 First Nations individuals served, including 72 women. Marion Miller Hill was one of them. Born and raised in the Six Nations community near Brantford, ON, Marion recalls trying to enlist as a young teenager. But she waited a year before she was accepted in 1944. Almost 66 years later, Marion still laughs when she remembers her family’s displeasure at her enlistment. But all across Canada, women were signing up. Not unlike stories we’ve heard about their male counterparts, Aboriginal women joined the military for many reasons; a sense of duty, to further one’s education, for adventure, or financial stability. Marion enlisted because she thought it would be a great experience. She was ordered to Toronto for a medical examination before being shipped to Kitchener ON for basic training. Marion knew she wanted to become a driver, because she was an ‘outdoorsy girl’. “They told me I was too small to be a driver,” she said. At just 5 feet 3 inches tall, she was just below the required height for an Army driver but was somehow granted a reprieve, and after basic training, was sent to Woodstock ON for a driving course before finally being stationed in Halifax, NS. There Marion drove anything from trucks and jeeps, to staff cars and station wagons. According to her daughter, Margaret Sault, “She drove the ‘higher ups’ around and did the oil changes and maintenance on the trucks.” Yet she weighed just 113 pounds. According to Grace Poulin, author of Aboriginal Women: Invisible Servicewomen in Canada’s WWII — the first scholarly publication dedicated to Aboriginal servicewomen — women were paid just two-thirds of what a man earned. And for Aboriginal women, there were other things to consider. Poulin says many faced racism as well. For some, it was subtle, like being ignored at an Army dance; for others, it was extreme, like one Aboriginal woman who claimed she had a lit cigarette rubbed out on her nose. When former service people were given compensation packages after the war, women were offered a dressmaking or hairdressing course, or a university education if they met the requirements. Marion took a six-month dressmaking course in Hamilton, ON. But some Aboriginal veterans received nothing. In 2003, Marion was one of many Aboriginal veterans who received additional compensation from the federal government. Despite such treatment of Aboriginal service men and women, Marion remains active in the veteran community. From her ten-year membership at the Hamiliton Ladies Auxiliary (now defunct), to her over 50-year membership with the Royal Canadian Legion. And she still recommends young Indigenous women join the military. “It’s educational, it teaches you how to care for yourself, its very helpful.” And, she says, it’s something she would do all over again.